The Fourth Lancaster One Minute Monologue Competition 2019 . Details coming soon. ​The Books on Lake District etc. page is mostly my private collection and sales from these will not go to charity, or Atticus events, unlike my other books on Asia and Eastern religions which I have donated to the shop. All of these can be accessed through the bookshop tab. Atticus is not for profit and supports Tasikoki Animal Rescue Centre. Donate via our Simply Giving page. Atticus sells secondhand books but also has a small stock of vinyl and CDs, small musical instruments and other odds and ends. We specialise in Indonesia and South East Asia, most of these books will be sold online and not kept in the shop. We are pleased to bring our online books into the shop for viewing and direct sale. 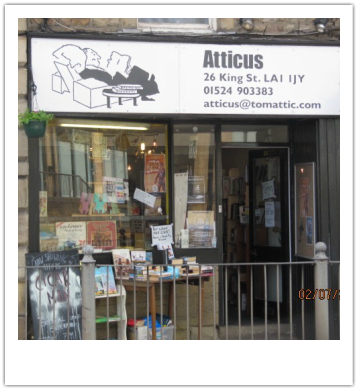 Atticus, the window, noticeboard and venue, is free to use by writers, artists, musicians and good causes. The centre table folds away and the shop can be transformed onto a small venue suitable for solo musicians, storytellers, talks and film shows. There is no charge for using Atticus, though a donation of cash or stock or help is always appreciated. We also have our own ongoing programme of events. Click here to see what's on. To contact Atticus please use the form below, email or text.